Telephone connections in India have crossed one-billion mark with mobile phones accounting for around 978 million, Telecom Minister Ravi Shankar Prasad said today. "In a population of 1.25 billion, we have got 980 million mobile connections, around 978 to be precise. We add 5-7 million new connections every month. Our phone connectivity has crossed one billion," he said while launching four telecom network products made by state-run technology centre C-DOT. The Minister said India has around 300 million internet connections and he has set target to achieve 500 million connections in the next two years. As per latest data released by sector regulator TRAI, total phone connections were 999.71 million at the end of April 30. Wireless or mobile connections stood at 973.35 million during the reported month. The government, under National Telecom Policy 2012, has set a target to "provide affordable and reliable broadband-on- demand by the year 2015 and to achieve 175 million broadband connections by the year 2017 and 600 million by the year 2020 at minimum 2 Mbps (megabit per second) download speed". 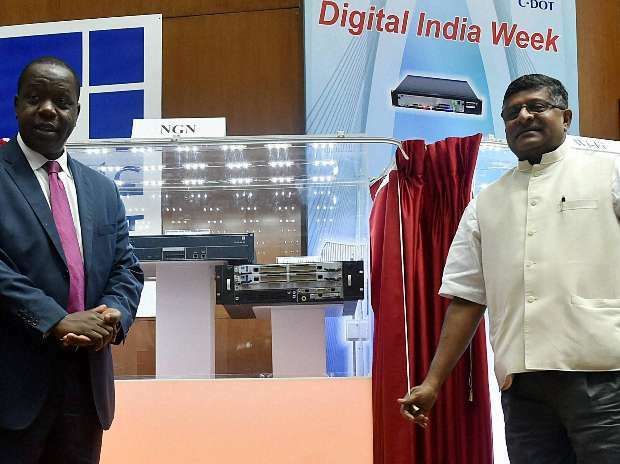 The Minister at the event launched long distance Wi-Fi system, solar-powered Wi-Fi system, 100 Gbps OFC (optical fibre cable) link and C-DOT Next Generation Network in MTNL Network. The Minister made video call on MTNL network to launch and showcase capability of C-DOT NGN product. The centre claims that its 100 Gbps OFC can transmit data up to distance of 50 kilometer without a booster or an amplifier. C-DOT claims that long distance Wi-Fi system is capable of providing 100 Mbps broadband speed to users of distant locations and can prove effective in its deployment in North-East India where connectivity and hilly terrain remains a challenge. The solar-powered Wi-Fi system can work in variable input voltages and in harsh conditions. Prasad said any quest for digital empowerment would always prosper and institutions like C-DOT have to play a very crucial role. He said Digital India would become reality if it is complimented with government's programme to boost local manufacturing (Make In India) and to make people employable (Skill India). "I hope technology developed by C-DoT get translated in to a widely accepted product. I have asked my officials to give lits of companies where C-DOT products are being used and in what numbers," Prasad said.